The Lower Colorado River Authority (LCRA) applied with the Lost Pines Groundwater Conservation District (District) for groundwater operating and transport permits for eight (8) wells, for a total combined maximum annual production of up to 25,000 acre-feet/year on February 21, 2018. 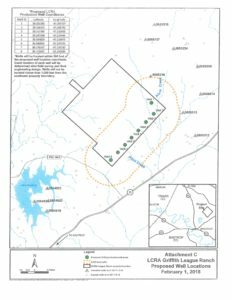 The LCRA acquired groundwater rights in the Simsboro formation of the Carrizo-Wilcox aquifer under the approximately 4,847 acre Griffith League Ranch (GLR) property in Bastrop County on January 9, 2015 by Warranty Deed. LCRA requested the permits include a phased approach to increase authorized pumping over time with Phase 1 total combined maximum annual production up to 8,000 acre-feet/year, Phase 2 15,000 acre-feet/year and Phase 3 25,000 acre-feet/yr. LCRA claims it has existing firm contractual commitments in excess of 400,000 acre-feet/year for a variety of beneficial uses, including municipal, industrial, recreation, irrigation/agricultural and instream uses. With few exceptions LCRA claims that the contractual commitments generally provide that LCRA may meet its obligations from any source available to LCRA. The map on the right shows the location of the proposed well-field site in Bastrop County, TX. The well-field is approximately northeast of FM1441 and northwest of HWY 21 going northeast out of Bastrop. More than 45 landowners and organizations, including Environmental Stewardship, provided oral and written comments to the Lost Pines GCD Board of Directors at the September 26, 2018 public hearing. About 135 persons officially protested the permit and about 50+ are requesting party status at the upcoming preliminary hearing scheduled to be held before the State Office of Administrative Hearings (SOAH) Judges on December 19, 2018 (see below). Click here for ES’ Comments to Lost Pines GCD at September 26, 2018 public hearing. Click here for more information on the Prehearing Conference held December 19, 2018.
impacts on water supply and property rights. about the date, time and other details regarding these proceedings. 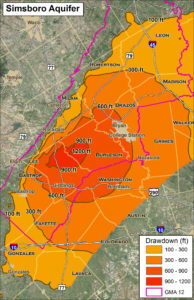 The maps below show the other commercial, non-exempt well fields near the LCRA Griffith Ranch project (left) and the drawdown in the Simsboro formation of the Carrizo-Wilcox Aquifer that is predicted to result from the pumping of 25,000 ac-ft/year over a period of 50 years by the same project (right). (Source: Review of LCRA Permit Application Packet). Unfortunately the Groundwater Conservation District considers the pumping from each well field on an individual basis and only for the target formation (Simsboro) that is being pumped. The District does not consider the impact of the combined pumping from all of the well fields on surface water, the other formations that communicate with the target formation, nor do they specifically consider the impact of the pumping on shallow exempt domestic wells. Project specific 50-year drawdown (in feet) in the Simsboro formation attributable to the proposed LCRA pumpage estimated using the GAM. (click map for larger view). 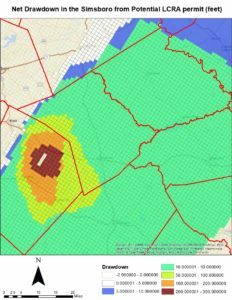 Location of large non-exempt well fields in proximity of the LCRA Griffith League Ranch Groundwater permit application (click map for larger view). approximately 225 to 250 feet at the three Aqua well locations (McDade, Behrend, and Highway 21). approximately 250 to 275 feet at the proposed “Recharge” (End Op) well locations. 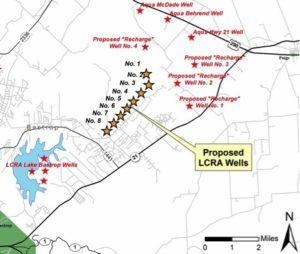 approximately 160 to 180 feet at the existing LCRA wells near Lake Bastrop. 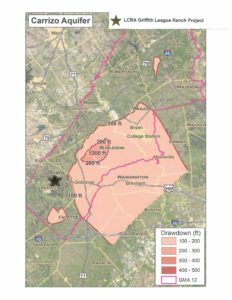 In comparison, the combined pumping of the Aqua, Recharge, LCRA, and Vista Ridge pumping — not including the LCRA Griffith Ranch project — are predicted to cause drawdowns in the Simsboro formation of 900 – 1200 feet by 2060. See study below. Study on the impacts of LCRA’s Griffith League Ranch groundwater pumping on the Carrizo, Calvert Bluff, Simsboro and Hooper formations and the Colorado River. Environmental Stewardship retained groundwater hydrologist George Rice to use the same GMA-12 Groundwater Availability Model (GMA-12 GAM) used by the Lost Pines Groundwater Conservation District — as required by the State — to evaluate the impact of LCRA’s requested Griffith League Ranch pumping over the 50-year planning period from 2010-2060. 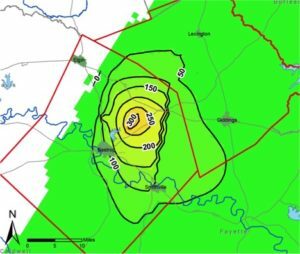 Not only the Simsboro formation, but also the Calvert Bluff and Hooper formations in the Carrizo-Wilcox Aquifer Group will be impacted by the LCRA’s pumping. It should be noted that the District, in its permitting process, reports the impacts of LCRA’s proposed pumping solely on the Simsboro formation, the formation where the LCRA wells would be located. The report also includes predicted impacts on the Colorado River and its tributaries. The District does not consider either impacts on other aquifer formations or impacts on the Colorado River. 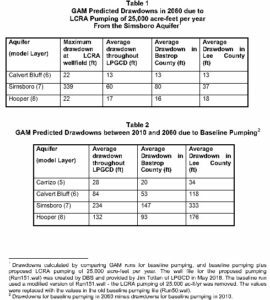 In summary, the GMA-12 GAM predicts that drawdowns in formations communicating with the Simsboro formation where the LCRA pumping alone will occur will be 22 feet by 2060 in the Calvert Bluff and Hooper formations at the LCRA well field. 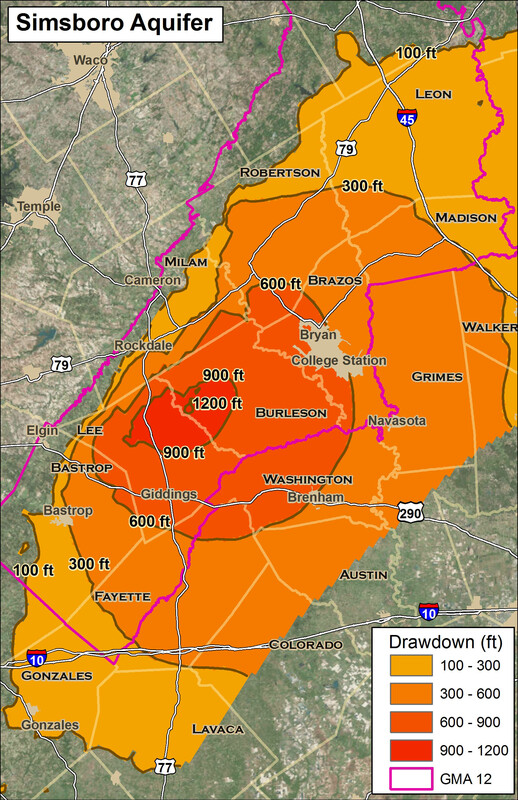 Average drawdown in Bastrop and Lee counties in the Calvert Bluff will be 13 ft. Average drawdown for the Hooper is predicted to be 16 feet in Bastrop County and 18 feet in Lee County. Drawdown in the Simsboro is predicted to be 339 feet at the LCRA wellfield, an average of 80 feet across Bastrop County, and an average of 37 feet across Lee County. See Tables 1 and 2. 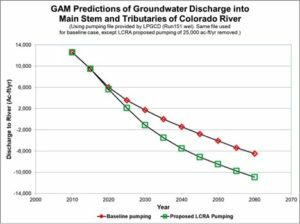 The GMA-12 GAM predicts that groundwater discharge into the mainstream and tributaries of the Colorado River will be reduced significantly over the 50 year planning period and will cause the river and its tributaries to reverse their current relationship to the aquifers. The river and tributaries currently GAIN water from the aquifers as they flow through Bastrop County. LCRA’s pumping further exacerbates the impacts of baseline pumping that is predicted to possibly cause the river to LOSE water to the aquifers. This reversal will mean that groundwater will not flow into the river, a situation that will be most damaging to the river and the terrestrial systems it supports during drought and extreme drought conditions when the river baseflow is largely groundwater. Reduce hydraulic heads in the Calvert Bluff, Simsboro and Hooper formations. The reduced heads in the confined portions of these formations would cause water levels in wells to decline. Reduced heads in the unconfined portion of the formations (recharge area) would cause dewatering of portions of the aquifers. Reduce groundwater discharge to the Colorado River, thereby reducing the amount of water flowing in the river. 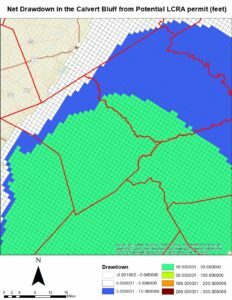 Rice FINAL REPORT: Evaluation of LCRA’s Proposal to Pump 25,000 Acre-Feet per Year from the Simsboro Aquifer. 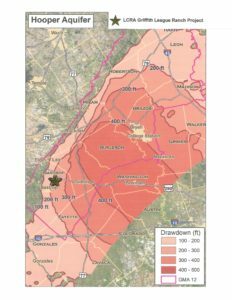 Drawdown Maps from the Rice Report show that the GMA-12 GAM predicts impacts on the Calvert Bluff and Hooper formations as a result of LCRA’s proposed pumping of the Simsboro formation. Though the Lost Pines GCD, LCRA and other water marketers will tell you that pumping groundwater from the Simsboro formation will not impact the other formations in the Carrizo-Wilcox group of aquifers, the model that is required to be used by the State to predict the availability of groundwater (GAM) predicts that these other formations will be impacted. The GAM model uses the best science available (2 documents, 789 pages, 398 Figures, 78 Tables, and 26 Appendices) as the basis of its design and development. Nothing in nature is impermeable, so there’s leakage between the formations. ES’ analysis of GMA-12 water budgets demonstrates and quantifies the predicted communication between the aquifers in the Carrizo-Wilcox Group and between the aquifer and surface waters. b) Vertical leakage: Vertical leakage from other aquifer formations into the Simsboro is the second most significant contributor of groundwater for pumping since 1975 (modeled to contribute 83,300 ac-ft/yr) and is the most significant contributor during the DFC period (modeled to contribute 69,800 ac-ft/yr by 2070). Vertical inflow to the Simsboro is most significant in Post Oak Savannah, Brazos Valley, and Lost Pines respectively during the DFC period. c) Lateral leakage: Lateral flow of groundwater from other districts into the Simsboro in Brazos Valley is significant during the DFC period. Lateral flows out of Lost Pines and Mid-East Texas are the most significant with moderate outflows from Post Oak Savannah. d) Storage changes: Storage is the least significant contributor of water for pumping since 1975. Storage increased during the calibration period and decreases during the DFC period but is net neutral for the period. It is misleading to state that most of the groundwater pumped is contributed from storage. The drawdown maps below reflect the best science available at this time. If the District and LCRA believe that these formations do not communicate with each other over the years, then they need to provide the science to refute the State approved model. 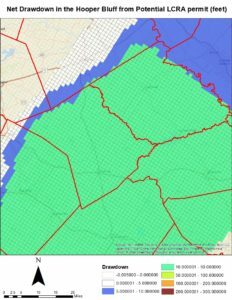 Until the District complies fully with the below statute, it will not have discharged its duty to consider the affects of LCRA’s projected groundwater pumping on existing groundwater and existing permit holders — including registered exempt well owners in the Calvert Bluff and Hooper formations. Section 36.113. PERMITS FOR WELLS; PERMIT AMENDMENTS. (a) Except as provided by Section 36.117, a district shall require a permit for the drilling, equipping, operating, or completing of wells or for substantially altering the size of wells or well pumps. 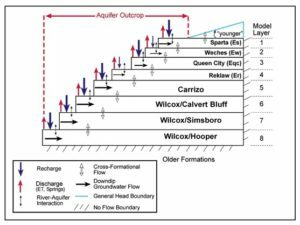 Another recent study predicts that the combination of all permitted and requested pumping of the Simsboro formation will impact other shallower formations in the Carrizo-Wilcox Group. THE STUDY DID NOT INCLUDE THIS LCRA GRIFFITH LEAGUE RANCH PROJECT. 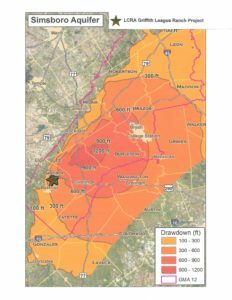 The combined pumping in the Simsboro formation is predicted to cause 900 to 1200 feet of drawdown in the Simsboro in Burleson and Lee counties by the year 2060 according to groundwater modeling conducted by professional hydrologist George Rice. The combined groundwater pumping within Lost Pines and Post Oak Savannah Groundwater Conservation Districts (GCD) are predicted to impact not only the Simsboro, but also the Carrizo, Calvert Bluff and Hooper formations extending to points as far away as Gonzoles, Lavaca, Colorado, Austin, Grimes and Walker counties. These formations are hydraulically connected throughout the Carrizo-Wilcox Aquifer Group. Click here for more information on the impacts of the combined Simsboro Formation Pumping. According to the Rice report, the effects of the pumping would not be limited to the Simsboro formation. The pumping would induce leakage from the Carrizo, Calvert Bluff, and Hooper formations. This leakage would reduce hydraulic heads in the aquifer formations. Where the formations are confined, the reduction in heads would reduce water levels in wells that draw water from the aquifer. Where the formations are unconfined (the shallow outcrop areas where many domestic wells are located), the reduction in heads would dewater portions of the aquifers. The position of these formations relative to the Simsboro is shown in figure 1. (adapted from TWDB, 2004, figure 5.1) (Click image for larger view). Leakage is a common and well-known phenomenon that is discussed in standard hydrology texts. In figure 1, leakage (cross-formational flow) between geologic units is indicated by double-headed arrows. In a 2009 pump-test conducted in Lee County, it was estimated that 22% of the water pumped from the Simsboro was derived from leakage from adjacent aquifers. Depending on where a Landowner’s property is located in the outcrop, the formations beneath the property will be the ones listed below the location. For example, if the property is in the Carrizo outcrop, the aquifers below the property are the Wilcox/Calvert Bluff, Wilcox/Simsboro, and the Wilcox/Hooper formations; in that order. A landowner owns the groundwater beneath his/her property in ALL of those aquifers. See, for example, Davis and DeWiest 1966, pages 224 – 229; and Freeze and Cherry, 1979, pages 320 – 324. The maps below show the approximate location of the LCRA Griffith League Ranch Project over the Carrizo, Calvert Bluff, Simsboro, and Hooper formations. The LCRA Griffith League Ranch Project is likely located in the Carrizo and/or Calvert Bluff formation outcrops. 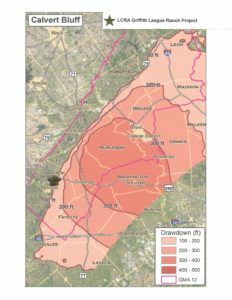 Landowners should find the general location of their property and wells on the maps below to be able to estimate the feet of predicted drawdown under their property within the 50 year planning period. Click on each map to see a larger view of the map.